Same Pick's is a special and limited edition with brushes of Sam's choice. 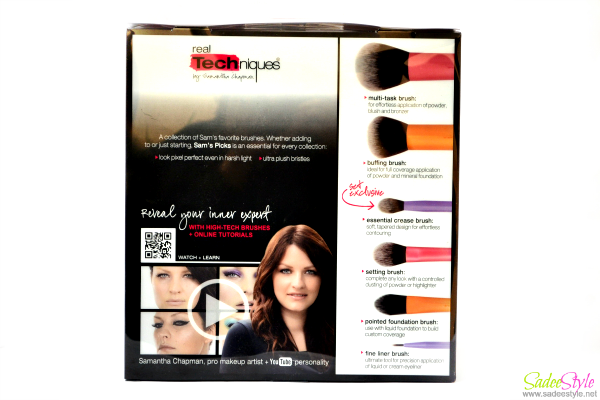 Pack comes with a collection of Sam's favourite brushes and includes six full sizes brushes for essential use. This one probably a most selling brush set in 2013 and has been finished almost everywhere, but I'm lucky enough to get one set from Escentual. I reviewed Real Techniques Duo Fiber Collection long back. It was also a limited edition set. However, I was not very impressed with synthetic brushes because they usually work with cream eyeshadows. 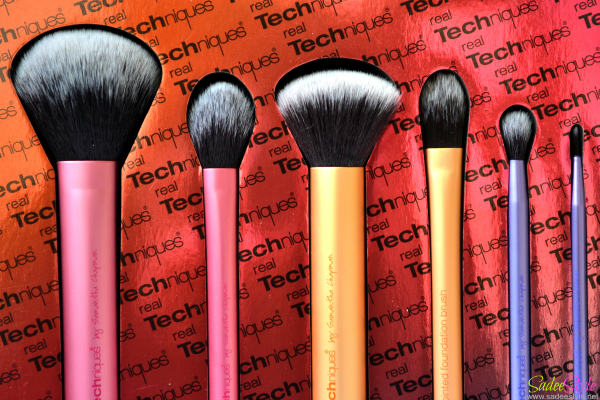 I always feel Real Technique brushes are not worth the hype brushes, but if you often use cream eyeshadow or apply foundation concealer with brushes then these can really a good choice. Multi-Task Brush: for effortless application of powder, blush and bronzer. Essential Crease Brush: soft, tapered design for effortless contouring. Setting Brush: complete any look with a controlled dusting of powder or highlighter. Fine Liner Brush: ultimate tool for precision application of liquid or cream eyeliner. I found this set quite better than the Duo Set because all brushes are more dense and fluffier than the Duo Set. Mine personal favorite are the essential crease brush and fine liner brush. Though I don't use liquid foundation or cream blushers often so these brushes are not my type, but I love how soft and smooth these are and ideal for the girls those love applying concealers or cream shadows. I also appreciate that these are cruelty free and don't shed. Overall I like the set comes with Multi-Task Brush which is so soft and dense and fluffy enough for flawless coverage and ideal for applying cream or matte blusher if I would not have sigma brushes I would defiantly love this one. 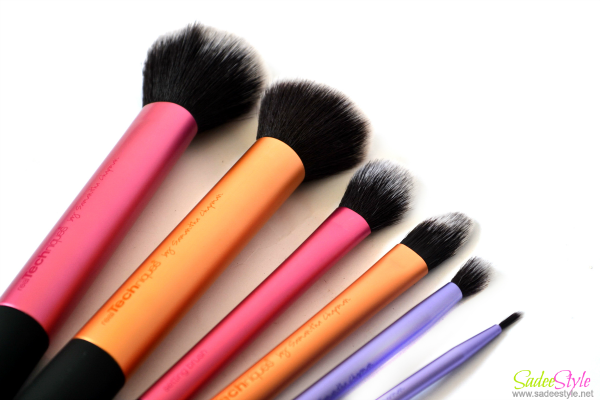 Buffing Brush is perfect of contouring and bristles are dense enough to pick right amount of the product. 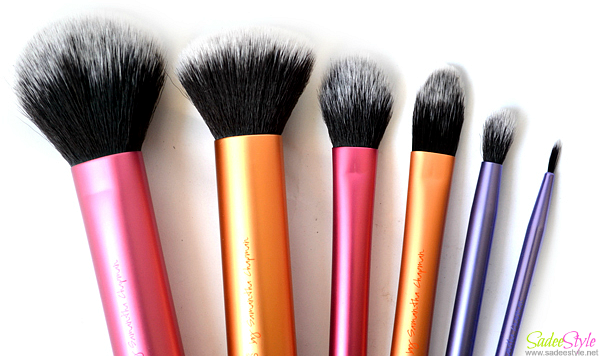 Pointed Foundation Brush and Setting Brush are smooth and very well shaped. I love the Fine liner brush and essential crease brush. Finer liner brush is very well shapes and size and made with synthetic bristles which is perfect for applying my favorite cream eyeliner. However, Since I have too many face brushes I would only love to have an eye brushes range. I got mine from Escentual and they cost about £29.99 and currently these are on super sale of 20% off and available in £23.99. Bristle made with synthetic those don't scratch. Every Brush is different colored and labelled for ease to use. 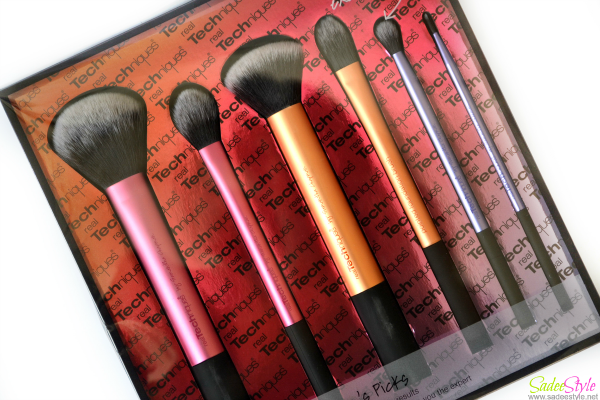 This one probably a good and quality set for the beginners with all essential brushes inside in affordable price. Not a bad price at all. I like that they don't shed. Thanks for sharing! I am madly in love with RT.Great pick this one.Loved your review.